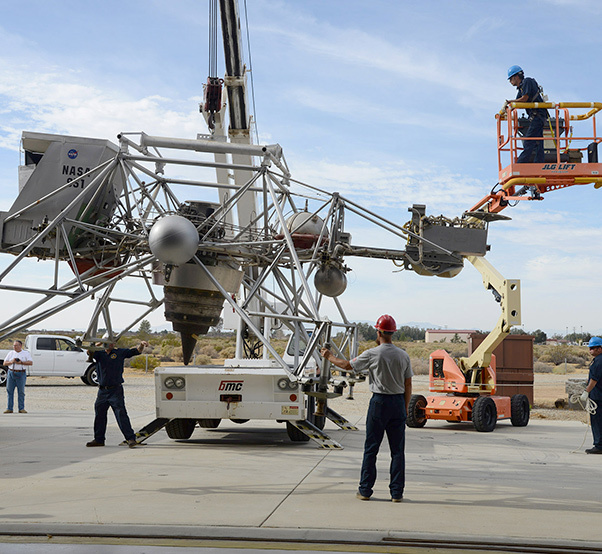 Workers lower NASA’s Lunar Landing Research Vehicle to the concrete behind the Air Force Flight Test Museum Oct. 13, 2016. The LLRV and the Space Shuttle Crew Transport Vehicle were both donated by NASA’s Armstrong Flight Research Center. 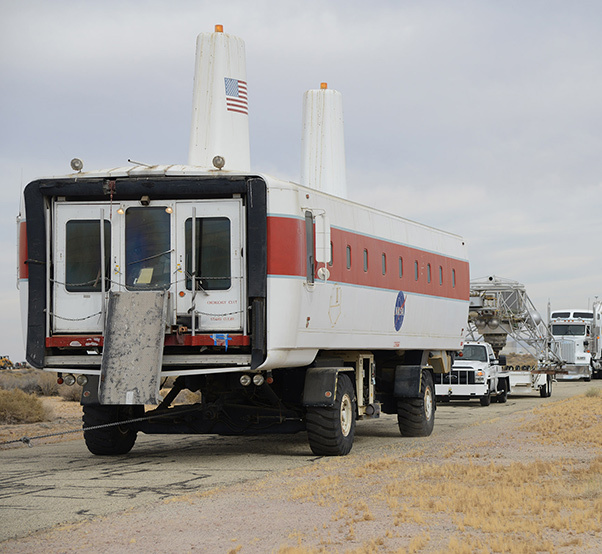 NASA’s Lunar Landing Research Vehicle and Space Shuttle Crew Transport Vehicle arrived at the Air Force Flight Test Museum at Edwards Air Force Base, Calif., Oct. 13, 2016. Both vehicles were donated by NASA’s Armstrong Flight Research Center. The LLRVs, humorously referred to as “flying bedsteads,” were created to study and analyze piloting techniques needed to fly and land the tiny Apollo Lunar Module in the moon’s airless environment. The CTV was used to transport crews from the Space Shuttle in the event of a landing at Edwards Air Force Base. The LLRV is now on display inside the museum. Public display of the CTV is postponed until the museum staff can meet with safety and power requirements for the vehicle. NASA’s Space Shuttle Crew Transport Vehicle and Lunar Landing Research Vehicle pass through the gate at the end of Edwards main runway on their way to the Air Force Flight Test Museum Oct. 13, 2016. Both vehicles were donated by NASA’s Armstrong Flight Research Center.